A cylindrical device that attaches to the end of a barrel of a gun and muffles the loud noise of a fired shot. A silencer works by adding volume to the short, narrow barrel, thereby reducing the pressure created by the hot gas that is released when the gunpowder is activated. 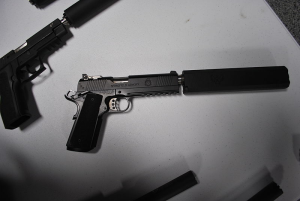 "SilencerCo Osprey .45 suppressor on a Springfield pistol, October 13, 2013" by DickClarkMises is licensed under Public Domain. N.d. How does a gun silencer works? http://science.howstuffworks.com/question112.htm, accessed June 23, 2015.